How’s your May so far, dearheart? 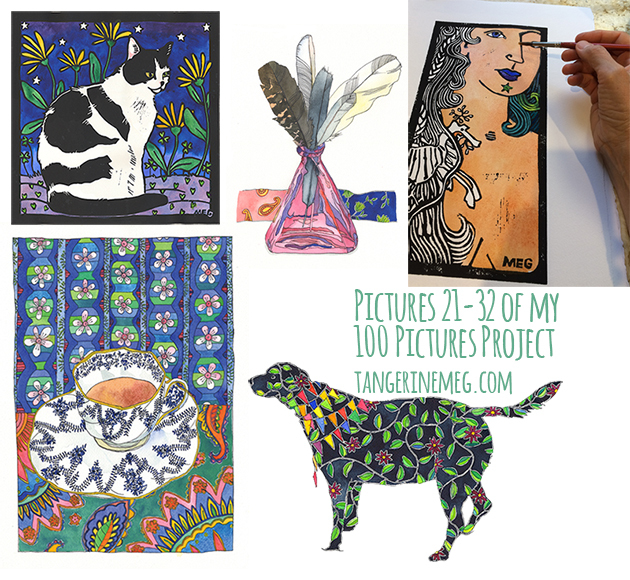 I’m kind of up to date with my 100 Pictures Project, kind of scrambling to keep the scanning, sizing, recording, showing of my art up with the actual *making* of the art! 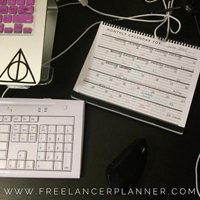 This blog post will remedy that in part. Crikey! So much behind the scenes-ing! 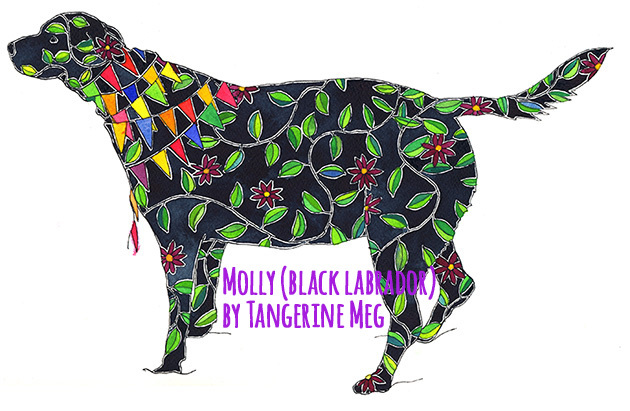 21 Molly (Black Labrador). I’ve been practising observing, drawing and painting dogs. This time I continued my dogs-on-white-paper experiment I started with Sunny last month. Click the picture to view &/or purchase in my gallery shop. 22 Pierre is a friend’s cat. 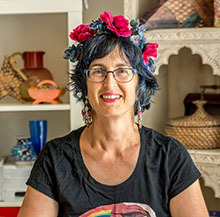 She has 4 beautiful cats (and several alpacas – how cool is that?) so stay tuned, there may be more in this series-within-a-series! Click the picture if you want the only other remaining print! 23 and 24 are are pen drawings done A4 sized, in visual diaries. There were several pages of other drawings on the black paper… I got kind of obsessed with the white gel ink lines and carried on and on. 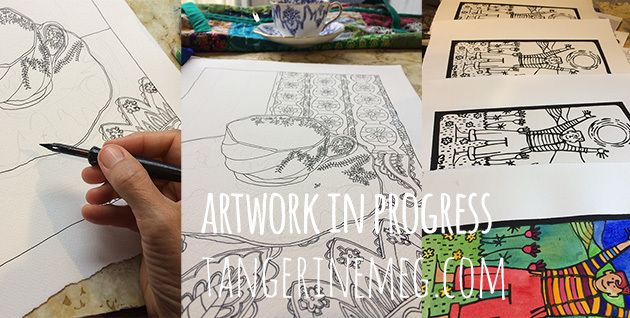 Let me know if you like the idea of the garden drawing as a t-shirt design… The black pen drawings on the right are intended to be a set of bookmarks. Stay tuned on that! 25 and 26 Almond Blossom Cat and Feathers in Pink Glass. While looking forward towards the Almond Blossom Festival at Willunga this coming August, this little blossom covered critter piped up and wanted to visit. The feathers in pink glass were calling to me too, from the shelves of my studio. As with Molly above, I kept up my recent, curiosity/practise of leaving the surrounds unpainted. Believe it or not, it takes quite a strong will! 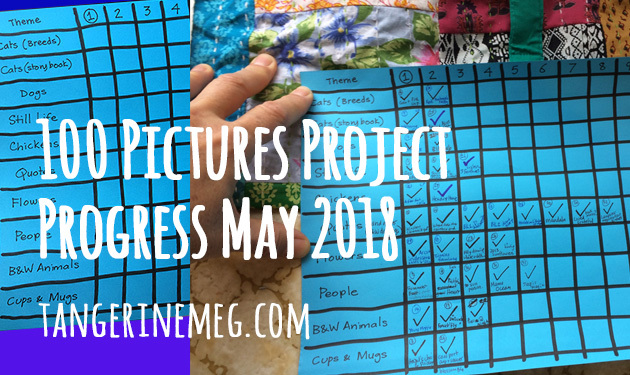 Click the picture above or below to check out the whole 100 Pictures Project page, or click the text links (purple text where your mouse turns into a hand) for the specific pictures. 27 and 28 Heading Home and Three Sunflowers. 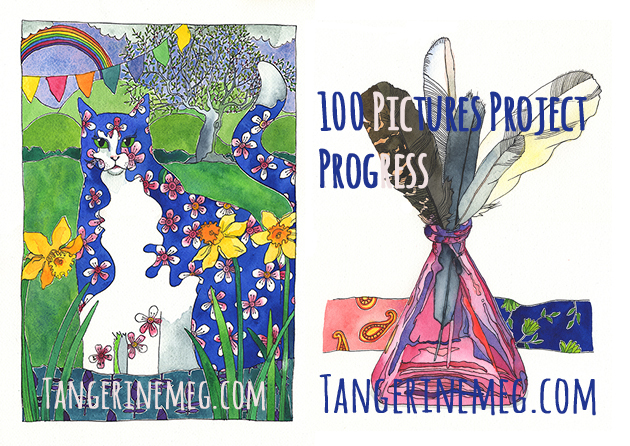 Click the image to go see the 100 Pictures Project in my gallery shop, and read about the green sheen chicken. 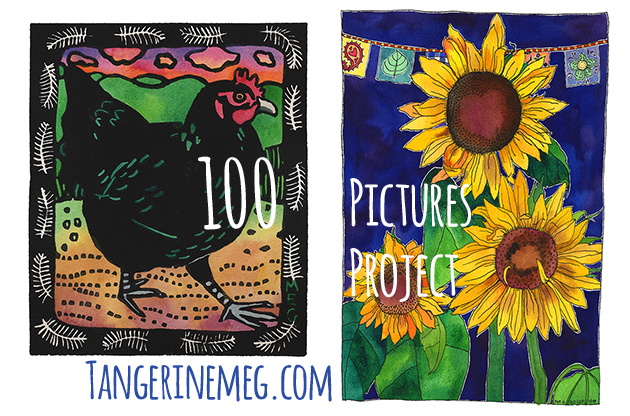 Three Sunflowers is sold, but you can give it a good look while you’re in the 100 Pictures Project section, too. 29 and 30 Cup and Saucer with Blossom and Sol Energy. Click the picture to check out the Still Life, completed. 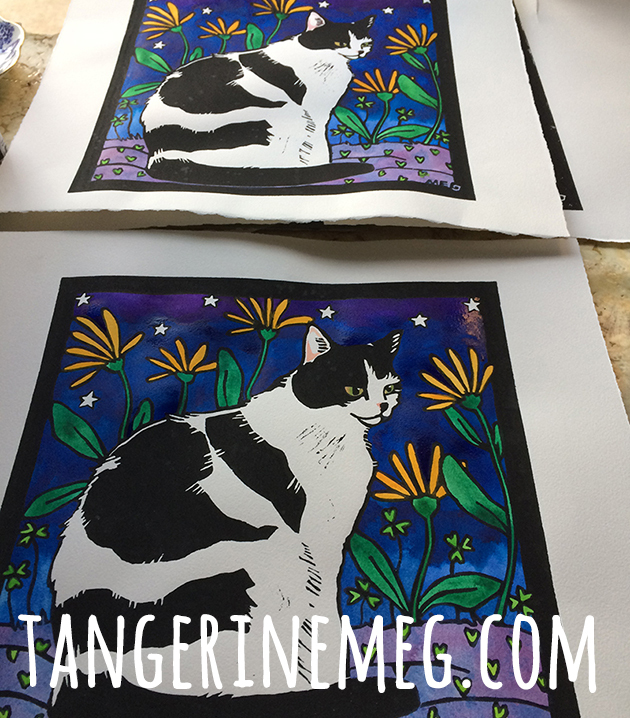 The joyful-person-in-the-sun lino print run isn’t completely painted yet, but you’ll find it on the 100 Pictures Project page, potentially awaiting guidance from you on the colour of the pants! See them all – maybe even get one for yourself! – at the 100 Pictures Project in my online gallery shop. In fact if you go there, you’ll might see more finished than were as of the writing of this blog post! Visible progress right? 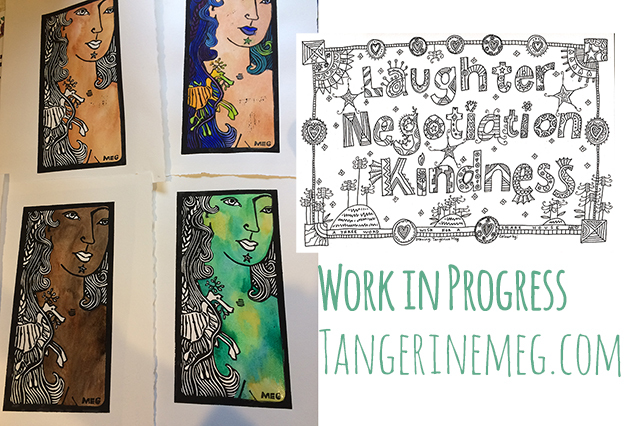 I was feeling regretful that I was all Behind the Scenes and no New Art this past week or so, but the progress chart is cheering me up now! I appreciate you. Mwah! 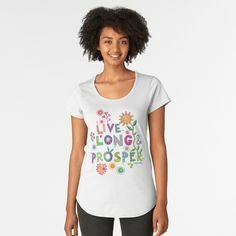 Have a lovely week! PS Print of the Month for May is *Thea (Rainbow Goddess)* a rainbow kitty radiant with love and light. The full collection of limited edition prints is available here. 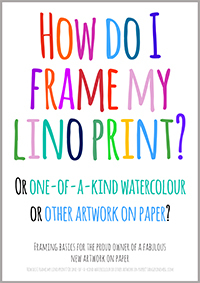 The giclee prints fit into standard A3 frames, and are fabulous reproductions of my art – the colours and accuracy of the prints are superb! PS3 Click this to see my Pinterest board with tips for Art Collectors!